Lab partners Emilie Heidel ’10 and Arda Kotikian ’15 work together in a lab for Chem 212. It’s 11:30 a.m. on the Tuesday after spring break, and twenty-three students have settled in Chem 212: Chemistry of Biomolecules class in Kendade 303. After some housekeeping items and a syllabus update, Professor Katie McMenimen ’03 launches into an exacting seventy-five-minute lecture. The material is dense, supported by formulas and graphics displayed on a screen in the front of the classroom. Students take notes furiously. There are frequent questions, and with each new query, McMenimen pauses. She wants her answers to have precision, to offer ample information—but not to overwhelm. Read about the extraordinary lives of Emma Carr, class of 1902, and Lucy Pickett, class of 1925, two changemaking women in chemistry. 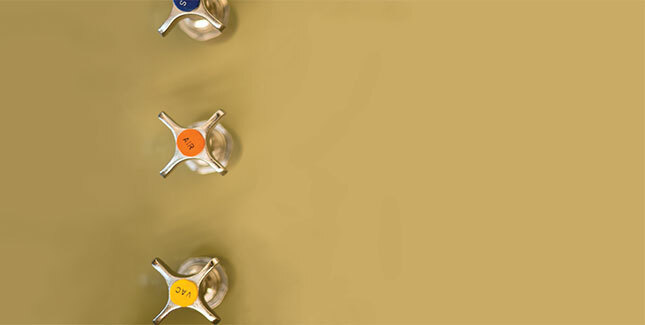 In fact, the entire rigorous chemistry curriculum at Mount Holyoke is a balancing act, as professors strive to provide relevant information in an industry that is constantly on the brink of discovery as well as prepare students for careers that may not yet exist. 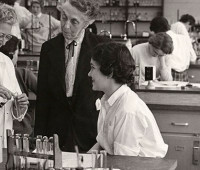 Mount Holyoke has a long history of national excellence in educating women in chemistry—and in the physical and life sciences in general. That history began with founder Mary Lyon, who was herself a chemist, and continued with faculty icons such as Emma Carr, class of 1902, and Lucy Pickett, class of 1925. These esteemed chemists each taught at the College for more than thirty-five years and were both acclaimed worldwide for their advances in the field. In addition, they each received the prestigious Francis P. Garvan Medal, granted by the American Chemical Society for distinguished service by women chemists. The chemistry department is one of eight campus departments housed in Kendade Hall, a 40,000-square-foot building completed in 2003 that connects existing Carr and Clapp laboratories and Shattuck and Cleveland Halls to form a unified science center. Gomez says one quarter of the College’s students major in either the sciences or mathematics—twice the number of women majoring in these areas at comparable coeducational institutions. Gomez says the College has recently acquired more state-of-the-art equipment than it has ever had, making the department even stronger. The College now boasts an atomic force microscope that affords students a view of materials at the atomic level. “You can see at the atomic scale,” Gomez says, noting the equipment is used by students to study the surfaces of various materials—such as polymers. The same technology is used for developing surface materials used in hip replacements and high-tech sports equipment. Gomez and her research students use the principles of thermo-dynamics, statistical mechanics, and quantum mechanics to study how structure affects proton and oxygen vacancy conduction in fuel cell systems. The primary research goal of Chen’s group is using materials chemistry to understand and impart important surface phenomena, such as wetting and biocompatibility of polymeric and inorganic substrates. Cotter has recently turned his scholarly attention to study the history of chemistry, focusing on the American chemical community between 1890 and 1920. Broaders’ research focuses on the interaction of living cells with their material surroundings. He employs the tools of organic synthesis to prepare materials with tailored properties like shape, stiffness, permeability, or response to external stimuli. McMenimen is interested in protein homeostasis and how dysfunction of molecular chaperones contributes to protein misfolding diseases, such as cataracts, Alzheimer’s, Parkinson’s, and other neurological diseases. One focus of Van Geissen’s research has been on the destabilization of a test protein and its potential to provide a mechanism for nucleating misfolded aggregates complicit in diseases such as Alzheimer’s and Huntington’s. Hamilton works with students on a variety of projects that use the tools of synthetic organic chemistry to prepare molecular systems with designed properties or functions. 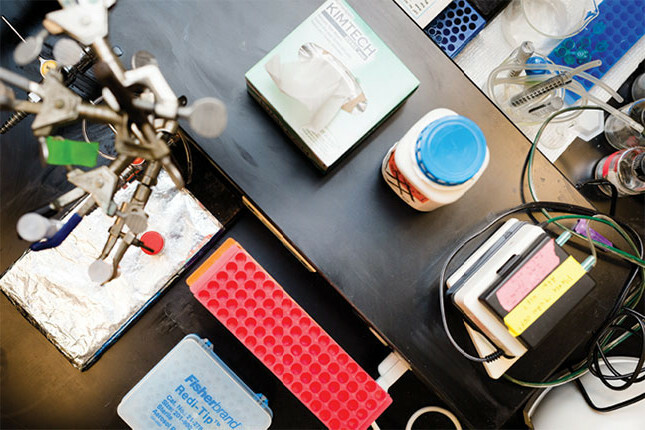 In fall 2013, nine spectrophotometers—devices used to measure the amount of light an object absorbs—were purchased through a $150,000 grant from the George I. Alden Trust, setting the department ahead of many peer schools in terms of instrumentation resources and crucial opportunities for students to learn and apply quantitative analysis skills. Thanks to a 2011 $500,000 grant from the Andrew W. Mellon Foundation, chemistry students are also involved in a cross-disciplinary project for the Mount Holyoke College Art Museum, in which students use modified digital cameras—with infrared lenses—to study the under-layers of paintings in the museum; their findings include a forged signature on a painting by William Louis Sontag as well as images that have been painted over in the final renditions of other works. 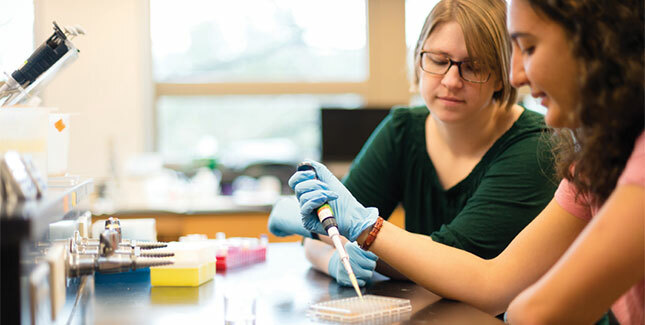 While not all chemistry majors come to Mount Holyoke knowing they’ll pursue study in chemistry, many applicants are attracted to the school precisely because of its strong recognition in the sciences. Rachael Mazzamurro ’15, a twenty-one-year-old with a bachelor’s degree in neuroscience and behavior, who headed to Dartmouth Medical School in August, chose Mount Holyoke over Smith and Brandeis, in part because of the College’s exceptional faculty and its reputation in the sciences. Mazzamurro has always wanted to pursue a career in medicine, and she enrolled in Chem 212 because it’s a prerequisite required by Dartmouth, where she will spend the next four of her roughly nine to twelve additional years of study. Mazzamurro says she’s proud that women hold powerful positions on campus. And she finds it empowering that the College teaches young women that they can excel in the sciences and in other fields traditionally dominated by men. Arda Kotikian ’15 also recognized her interest in science and engineering early on. 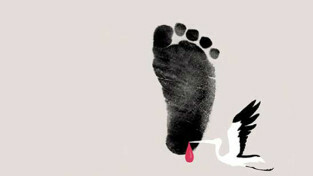 As a child she built treasures from trash, such as shoes she fashioned from scraps of cardboard. “I like playing with things,” she says, noting that she hopes to be an inventor one day. Kotikian graduated with a double major in math and chemistry and this fall began work on a doctorate in materials science and mechanical engineering at Harvard’s School of Engineering and Applied Sciences. In summer 2014, Kotikian completed a Lynk-funded internship at Harvard, where she was tasked with developing materials to be used in 3-D printing processes and with creating materials that are used to monitor heart tissue contractions. She loved the creativity behind the labor. Biochemistry lecturer Tim Miles leads the Chem 212 lab that meets six times throughout the semester to supplement classroom work. During one particular session, Mazzamurro, Kotikian and Emilie Heidel ’10, a post-baccalaureate premed student in her third year, were part of a group working to bring a semester-long project to a close. Kotikian and Heidel, paired at a lab station at the end of the room, talked quietly about their individual roles in the experiment. They were surrounded by beakers, syringes, experiments in various stages, and state-of-the-art equipment, like one of the newer spectrophotometers. Heidel says the knowledge she gained through her lab work will be useful to her in medical school and beyond. It can, for instance, be applied to the work of studying diseases and the development of new treatments. In addition to learning critical laboratory skills as they worked with partners, Kotikian and Heidel also bonded and developed their “people skills,” as Kotikian says. In fact, in each of their respective departments, they have formed deep connections with peers and with professors, in and outside of the classroom. Extracurricular offerings support this outcome. In addition to chemistry socials that are held at the end of each semester, the department also offers biweekly luncheons, during which students compare notes on topics ranging from how to write a research paper for a fellowship application to how to email a professor, a topic often raised by first-years students. In addition, lectures organized by the department are also held weekly, with speakers covering a broad range of topics. The annual Lucy Pickett Lecture is a major draw. This year, nearly fifty students attended a presentation by Polly Arnold, Crum Brown Chair of Chemistry at the University of Edinburgh, Scotland, who champions women in chemistry and in sciences in general. Professor McMenimen says students had so many questions for Arnold that the lively dialogue continued over dinner across the street at Food 101, and Arnold had questions of her own. “She was interested in the students and what they’re learning and what they’re interested in,” McMenimen says. Kotikian, who attended the lecture, says such events build community at the College. 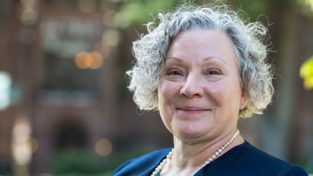 “The main point is to get everyone together and build connections,” she says, noting the result is a tight-knit department in which students study together and professors and students connect. “They show they care about you,” she says. 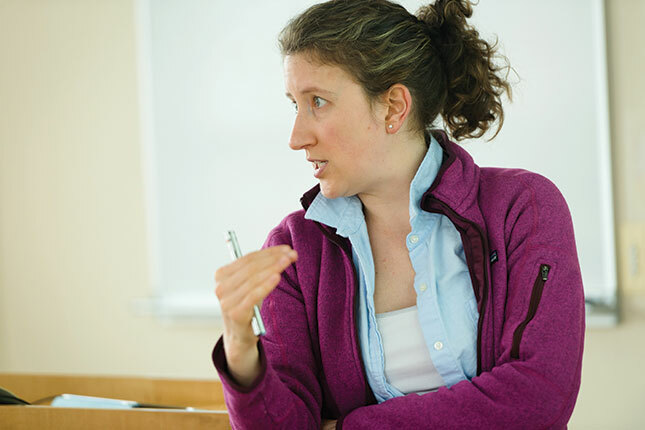 Building on the strong reputation of the department’s history, current chemistry faculty develop model curricula in cross-disciplinary areas, continuing to position Mount Holyoke at the top of its peers. Many of these professors have strong interdisciplinary interests, resulting in a culture in which faculty regularly collaborate on cross-disciplinary curricular initiatives and develop research projects that involve students from different departments. The College’s new Engineering Nexus program is an example of this important focus. The program allows chemistry students to investigate chemical and materials engineering and also crosses department lines into physics, math, biology, and environmental sciences. Currently, Gomez says, ten students are enrolled in the Engineering Nexus; several are chemistry or biochemistry majors. Mary Lyon likewise strived for the best, and she persisted against all odds. In the three years she spent raising donations and awareness about her college for women, she endured ridicule from those who felt her ambitious undertaking would be “wasted” on women. But her work has been continued by generations of young scientists and the faculty who have led them, and the College continues to be recognized for its strength in the sciences. 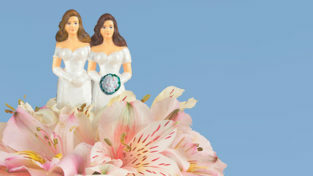 A 2009 National Science Foundation study notes that Mount Holyoke ranked sixth among all selective liberal arts colleges in producing women who received doctorates in the life sciences from 1966 to 2006. During the same period, the College ranked first in graduating minority women who received US doctorates in the physical and life sciences. And as part of the largest class of graduates embarking on life outside the College’s gates, Mazzamurro, Kotikian, and their sisters in the class of 2015 are the next in a long line of women to continue the work that sustained them in the classrooms and labs of their undergraduate days. Janice Beetle is a writer and communications professional in the Pioneer Valley and the owner of Beetle Press. A fabulous college to study chemistry, hands on! Nostalgic about the enthusiasm of Sheila Browne and the erudition of Jan smith. A class apart!